Shooting Lab ™ was the first component of the Shooting Lab system introduced in 1998. It was the first product to fully incorporate the work of ballistician Robert L. McCoy into a commercial product. 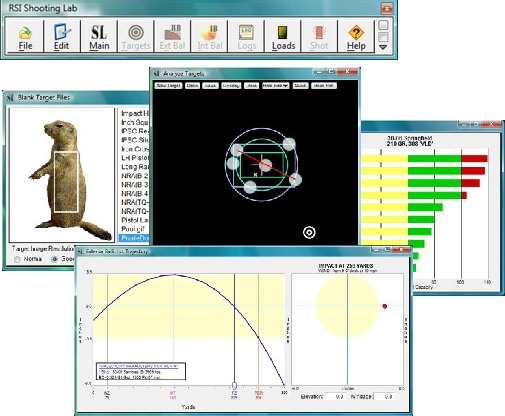 Our Shooting Lab software is more than just another "exterior ballistics" program. It includes tools to help analyze loads, keep proper records, and more. Review the information and samples on this page. Or, try a 30 day free demo with documention. Other components of the complete Shooting Lab system include the CED M2 Chronograph and our PressureTrace system. One measure of software quality is its user interface or how easy the program is to use. The Shooting Lab is packed with features that make it as "user-friendly" as possible given some of its technical subject matter. Information only needs to be entered one time to be accessed throughout the program with a simple mouse click. And, its design is flexible, so you can customize the program for your own personal shooting needs. Locations within the Shooting Lab program can be opened from a navigation palette, menu or keyboard commands. Data is linked between the various segments to reduce entry effort and allow quick retrieval via user defined pop-up menus. There are also general utilities that may be accessed from a "Main Lab Menu" anywhere in the program. The Shooting Lab takes exterior ballistics several steps further than other programs. Like other products it will compare the trajectories of different calibers and loads under varied shooting conditions, calculate the optimum sighting range and game for a load, or the windage and elevation adjustment needed to hit a target. Most importantly Shooting Lab will reproduce published trajectories or duplicate "real world" results to long ranges. Don't trust the B.C. 's provided by bullet companies? (You shouldn't.) The Shooting Lab will calculate perfect sea level ballistic coefficients for any bullet fired from your firearms and even use Doppler Radar .drg files. Included are drag curves for everything from the new "VLD" bullets to rimfire and balls. It will match your bullets to the best drag curve, convert B.C. 's and even create "custom" .drg drag curve files from just bullet dimensions! Compare Shooting Lab to other "ballistics only" software and you will recognize it has more features than any other product. Or, Download the User Guide for detailed Info. There is much more good shooting software should do for you then simply model exterior ballistic trajectories. This part of the Shooting Lab uses a novel method to plot and analyze your targets. It will help you identify problems with a firearm, your shooting technique or adjust gun sights. The segment will even export target data to a spreadsheet program so you can monitor shooting performance over time, manipulate the data or produce customized graphs. Serious shooters understand the importance of keeping a shooting log. Competitive shooters always "shoot in" their barrels before expecting them to be accurate, and know some barrels have a limited life span. This part of the Shooting Lab provides a convenient way to keep a shooting log and pertinent information about your firearms. Individual firearm records include the number of rounds fired and information needed for insurance records. Rounds fired from a firearm and entered in this segment are deducted from the loaded-round inventory on file in the "Reload Records" segment. You will always know how much of your favorite ammunition is available for the next trip to the range. Firearm data can be exported to a spreadsheet program to add information, create custom records and graphs, or manipulate the data any way you want. In addition to exterior ballistics the Shooting Lab includes segments for analysis of powder load density with burn rate tables and gyroscopic stability. This segment will help you select bullets, powders and charges to improve your loads. Shooting Lab does not attempt to forecast pressure and velocity using questionable mathematical models. It is our firm belief this can only be done safely and accurately with instrumentation. The complete RSI Shooting Lab system includes a CED M2 Chronograph and/or PressureTrace device for these purposes. This part of the Shooting Lab provides a convenient way to store information about experimental loads, components, loaded round inventory and test results for quick retrieval. It will even print box labels for your reloaded ammo and store bore sighting information. The bore sighting information will help re-zero guns for changes in shooting conditions and loads; or even swap scopes without wasting time and ammunition. If you shoot at different elevations and climates or change scopes, this part of the Shooting Lab will be extremely useful. This and other segments of the program are interlinked. Just drag a load from the index to other windows to transfer data. The Shooting Lab for Windows will run on any Pentium class Wintel system with a color display capable of at least 1280 X 960 resolution, a CD Rom drive and Windows XP-SP3 or newer including Vista and Windows 7, 8 or 10. Upgrades and Updates have been free to all registered users for 20 years! Try the Shooting Lab demo for 30 days! $59.95 when purchased with other products. Or, Order the Shooting Lab On CD Rom. Earn discounts by ordering more than one RSI product.